Cemeteries, no. 24: the Barnes family. We pulled over on the side of the highway here, got out and started trudging along the treeline. The ground was saturated from heavy winter rains, and I had not worn the right shoes. Nonetheless, we traipsed back and forth, looking for the Simon and Penninah Woodard Barnes cemetery. Barnes/Woodard/Lassiter descendant Bernard Patterson had graciously offered to help me find it. However, the land is no longer family-owned, and he had not been there in many years. We did our best, but a thick growth of broomsedge, prickly smilax vines, and young trees prevented us from locating it. Penninah was the daughter of London and Penelope Lassiter Woodard. She married Simon Barnes on 1 January 1877 in Wilson County, and they and several generations of their descendants are buried in a family graveyard located off what is now N.C. Highway 42. The photo of Pennie Barnes’ grave, below, was taken during a period in which the plot was cleared. Eastern North Carolina’s climate makes rural cemetery maintenance a serious challenge, especially when graves are located on private property far from paved roads and the cemetery is not in active use for burials. Thanks again to Bernard Patterson. Top photo by Lisa Y. Henderson, February 2019; bottom photo courtesy of Roger Barron. Cemeteries, no. 22: John and Bettie Hinnant Jones family cemetery. This small family cemetery is adjacent to the Sane Williams graveyard, described here. The graves of John A. Jones and Bettie Hinnant Jones lie under two of the brick vault covers seen below. In the 1880 census of Old Fields township, Wilson County: Dempsy Powell, 52, farmer; wife Sallie, 46; daughter Susan A. Jones, 27, and her husband John A. Jones, 34; their children Thomas A., 13, Jessee B., 11, James A., 7, Celia C., 5, Sallie C., 4, and John A., 1; and W.D. Lucus, 21, laborer. John A. Jones, 20, of Old Fields, son of John A. and Susan Jones, married Celia Williamson, 18, of Old Fields, daughter of Spencer and Senia Williamson, on 17 January 1898 at Jim Jones’.Witnesses included Thomas A. Jones. In the 1900 census of Springhill township, Wilson County: farmer General V. Hinnant, 38; wife Martha A., 35; and children Alice V., 13, Minnie A., 12, Ezekiel, 11, Bettie J., 9, William V., 4, Oscar, 2, and Herman, 2. In the 1910 census of Springhill township, Wilson County: farmer Vandorne Hinnant, 48; wife Betsy J., 46; and children Ezekial, 22, Bettie, 19, Willie, 13, Oscar, 12, Luther, 10, Regest W., 9, Roland, 8, Ralon, 6, Ollien, 4, and Roy E., 2. J.A. Jones, 34, son of John A. and Susan Jones, of Old Fields, married Bettie Hinnant, 21, daughter of Vandorn and Janie Hinnant, of Springhill township, on 5 May 1912. Missionary Baptist minister William H. Mitchiner performed the ceremony at the Hinnant home. In 1918, John Alce Jones registered for the World War I draft in Wilson County. Per his registration card, he resided at R.F.D.#1, Sims; was born 25 January 1897; was a self-employed farmer; and Bettie Jones was his nearest relative. In the 1920 census of Old Fields township, Wilson County: on Jones Hill Road, farmer J.A. Jones, 42; wife Bettie, 28; and children Johnie W., 16, Grover, 7, Susie, 5, Maomie, 4, and Ruth, 1. In the 1930 census of Old Fields township, Wilson County: John A. Jones, 53, farmer wife Bettie J., 39; and children Grover L., 17, Sussie J., 15, Namie, 13, and Ruth, 11. John Asley Jones died 21 April 1962 in Rocky Mount, Nash County. 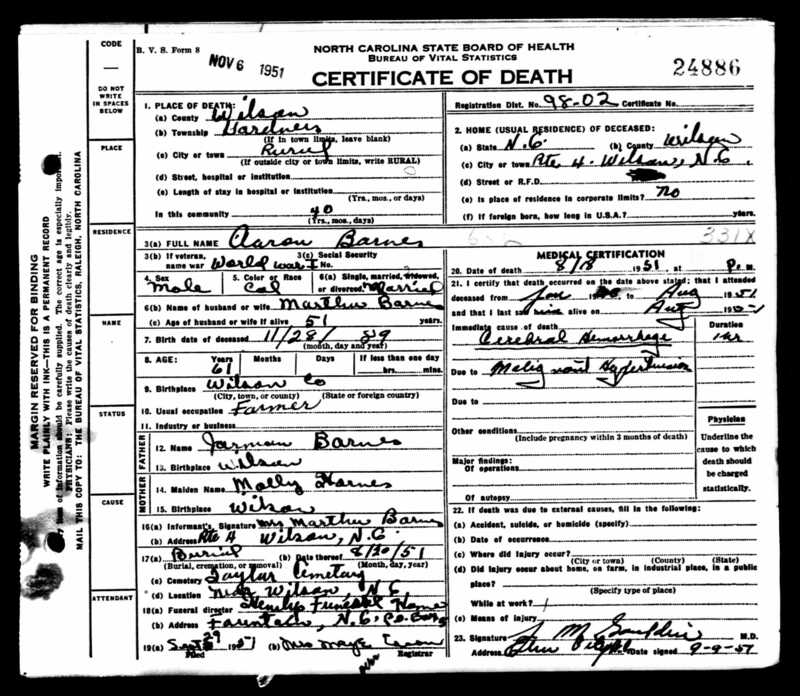 Per his death certificate, he was born 25 October 1878 in Wilson County to John Allen Jones and Susan Powell; was married to Betty Hinnant; was a retired farmer; and lived in Sims, Wilson County. Bettye Hinnant Jones died 21 May 1866 in Enfield, Halifax County, North Carolina. 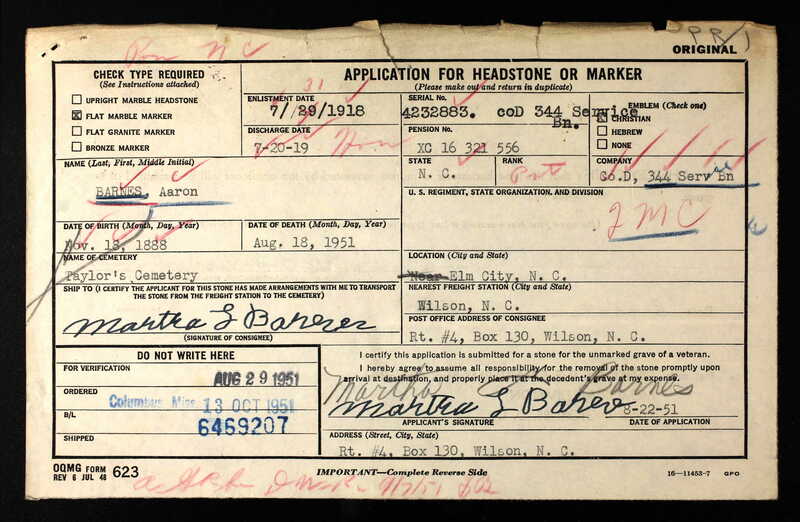 Per her death certificate, she was born 2 February 1891 in Wilson County to Vandorn Hinnant and Martha Jane Horton; was widowed; and resided in Sims, Wilson County. Photographs by Lisa Y. Henderson, October 2018.